Chéri Samba is a painter from the Democratic Republic of Congo. He lives in Kinshasa and Paris. Cheri Samba Paris is part of the Louis Vuitton Travel Book series, where each book is about one location and illustrated by a different artist. This book collects the personal travel experiences of Samba as he wanders around Paris. It's presented in sort of a comic book form where each page or double page is a panel. Occasionally, there would be speech balloons or narrative, but written in French though. He would appear in his own paintings sometimes. And he says when he used to put people in his paintings, some of them would recognise themselves and create problems. The interesting thing about the artworks would be the dominant blue pink colour used throughout. 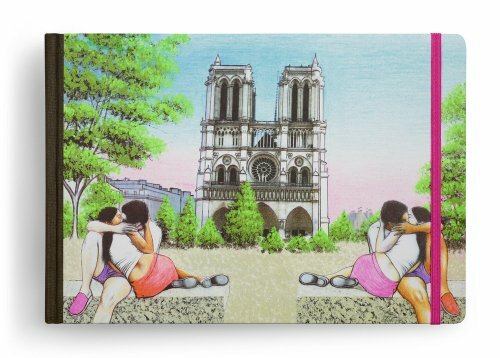 The blue pink background appears as background for the sky, and contrast strongly against the Paris buildings and scenes. Personally, I felt that the colours are out of place as they are quite jarring. But it's certainly quite different way of depicting Paris, although not a style that I'm accustomed to seeing. The scenes captured are what a tourist would probably experience the first time being in Paris, such as taking the train, visiting the places of interest, seeing lovers kissing, and of course looking at the architecture of the city. All the buildings in the book are painted with great detail. Samba seems to have a preference for painting buildings in symmetry as quite a few of them appear that way, even for the one on the cover. It's not a cheap book, even for the standard edition. There's also a limited edition of 50 boxed, leather-bound copies are available at selected Louis Vuitton stores. This is a book you would probably want to flip through before deciding whether to buy. I prefer the earlier ones that I've reviewed for London, Vietnam and Venice.